Lost Dogs of Wisconsin has different tools available for use when trying to locate a missing dog and one of them is the organization’s group of Craigslist Monitors. As we’ve seen first-hand, Craigslist is more than a website where you can find details regarding an upcoming garage sale or a great deal on an item, it’s also a website that has been instrumental in reuniting lost pets with their owners. 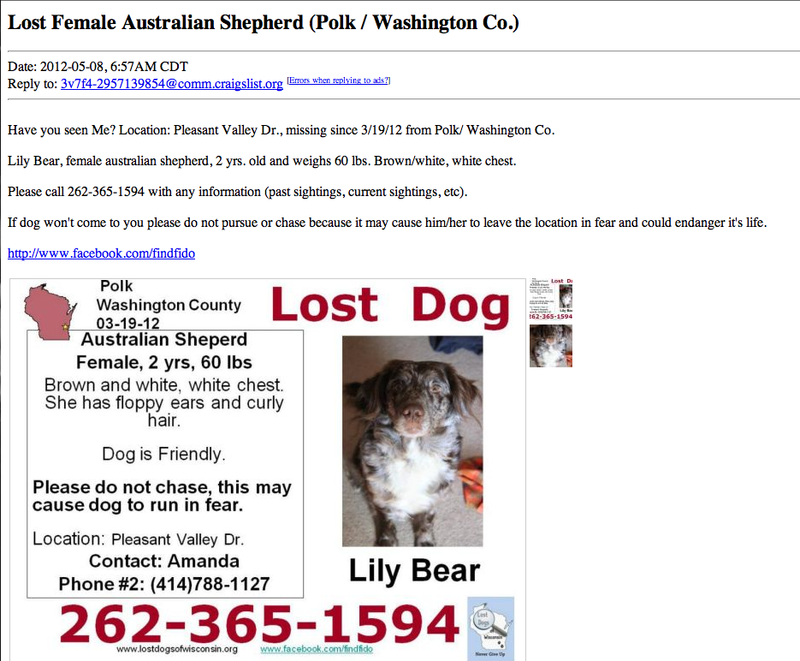 And it’s been instrumental for Lost Dogs of Wisconsin because of our Craigslist Monitors. Our Craigslist Monitors are a dedicated group of individuals who work hard to return lost dogs to their respective owners by continuously reviewing each of the 12 Craigslists dedicated to different areas of Wisconsin. Whenever someone posts information about a lost or found dog on one of these twelve Craigslist locations, our Monitors send the person our informative flyer that details five things the individual should do. When a dog is reported as lost on Craigslist, our Monitors immediately send the person who posted information about the dog links to LDW’s Facebook page and website. Our Monitors also provide the person with a detailed Action Plan so the individual is prepared to begin searching for his or her dog. Our Monitors have the person complete a Lost Dog Report as well. When someone puts up a post about having found a dog, our Monitors immediately send the individual links to LDW’s Facebook page and website. The Monitors also share a link to our 2011/2012 Still Missing Album so the person can see if the dog he or she found matches any of the dogs in the collection. Finally, our Monitors have the individual complete a Found Dog Report. Our Monitors also scour images of lost and found dogs to see if any of the ones reported on Craigslist match other posts on Craigslist or posts on other websites. When a Monitor successfully matches a lost post with a found one, or vice versa, the Monitor instantly alerts one of our Caseworkers. Without our Craigslist Monitors, we at Lost Dogs of Wisconsin would not be as successful as we are at reuniting lost dogs with their owners. We want to take this opportunity to thank everyone who volunteers with Lost Dogs of Wisconsin as a Craigslist Monitor individually. Thank you, Chris B., Barb M., Julie L, Karla L. and Kim V.
We couldn’t do this without each and every one of you! This entry was posted in Our Organization. Bookmark the permalink.